When seeking the ideal candidates to fill open professional staff positions, there are many considerations that should go into a well-planned search. A search at TPE provides unique opportunities and challenges for an employer just as it does for a candidate. I have enjoyed serving on several search teams as well as on the TPE Planning Team, and I feel confident that you will discover the rewards of recruiting candidates at TPE. As you plan for your time in Philadelphia, be mindful of how you stay organized, when you review candidates, and how you ensure that you are reviewing candidates in a fair and consistent manner. With so many employers, candidates, tables, and positions, it is important that an employer at TPE finds a system to be as organized as possible. Plan on which interviewers from your institution will interview which candidates at which table numbers for which position. Plan to have files set up ahead of time with candidates who have pre-scheduled interviews and blank files for those you choose to interview on-site. Having a complete file for each candidate makes it even easier to review TPE candidates; such a file may include resumes, cover letters, applications (if applicable), interview responses, and any candidate correspondence. If you have multiple (different) positions, you may need to be twice as organized. Use the TPE schedule accordingly to best assist your team in reviewing and selecting candidates to move on through your process. You should evaluate candidates between interviews and/or during breaks while the recent candidates are fresh on your mind. If you are hosting a social on Thursday or Friday evening, determine how to best use it to assist in screening applicants. An institution may choose to use their social as an added screening tool. Such an institution may start with so many candidates being interviewed, offer a smaller number of social invitations, and later invite only the candidates that best come across as a fit for your institution for an on-campus interview. Tier your candidates before leaving Philadelphia so you can focus first on several candidates though you are ready should you need to move on to other candidate tiers. Some institutions need to also work with HR at home to ensure the process is fair for all candidates. 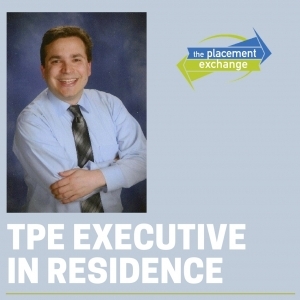 You may have a unique university HR portal or application process that may cause some challenges when not all applicants are attending TPE and not all TPE candidates have applied prior to arriving to Philadelphia. Your institution may need to offer similar interviews for candidates both attending and not attending TPE alike. It is also important for your institution to review candidates in a consistent manner. My institution only offers TPE interviews after a TPE candidate applies to our online HR application, and we offer phone interviews for candidates not attending TPE or OPE. Ultimately, we work diligently to create a seamless experience for all qualified candidates regardless of where they chose to interview. While conducting interviews and reviewing candidates is a priority for you and your team at TPE, please remember to practice self-care, take breaks, and enjoy your time while at TPE. Perhaps even volunteer or serve as a coach or other role while you’re in Philadelphia. Dr. Cory Shapiro is the Assistant Director of Leadership and Development for University Housing at Arizona State University and brings extensive experience in housing & residence life, new student programs, career services and research & assessment. He attended The University of Arizona, earning a Bachelor of Science degree. Dr. Shapiro received a Master of Arts from The Ohio State University and a Doctor of Education in Higher and Post-Secondary Education from Arizona State University.